CDI-XW-AFC-100 - 10x 1.0oz X-Wide Air Foil Clips Reliability Direct, Inc. Your Direct Source for Reliability, Maintenance, Test & Measurement! 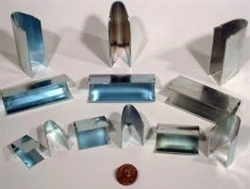 Air foil clips are used on blowers manufactured by companies such as Trane, Carrier, Twin City, New York and Chicago Blowers. Available in 10 clips per pack. Standard Air Foil Balancing Clips - 3/4" / 1.1"
Extra Wide Throat Air Foil Balancing Clips - 1.1" / 1.2"
Narrow Air Foil Balancing Clips - 0.550" / 0.9"